Impralit® IT ensures an exceptional timber protection as well as safety for humans and the environment: it is completely free of heavy metals, it guarantees extraordinary results and has a high level of working safety. Impralit® IT can be applied by brushing, dipping or spraying in spraying tunnels or tank immersion in stationary tanks. 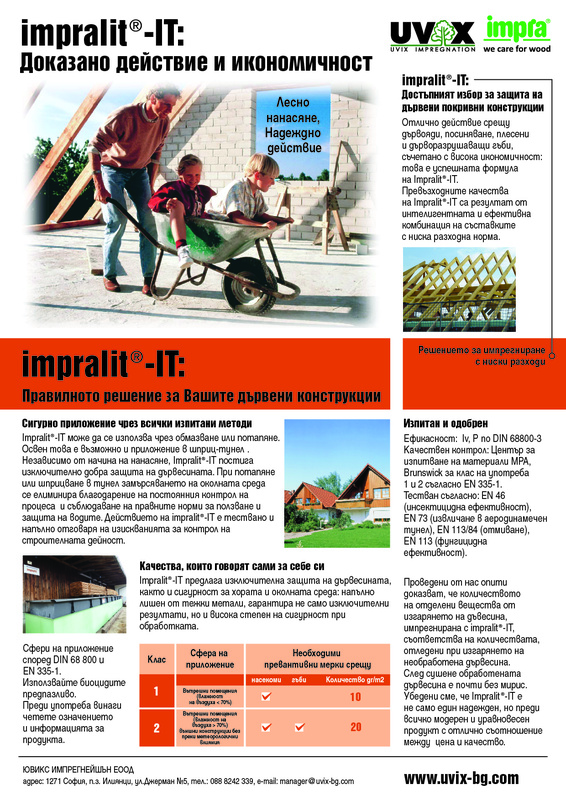 Regardless of the application method, Impralit® IT achieves an excellent timber protection. The result of using Impralit® IT has been tested and the effects completely correspond to the requirements for construction work control. Excellence and efficiency: this is Impralit® IT's formula of success. The qualities of Impralit® IT result from the intelligent components combination and the product's cost-efficiency. Quality control: МРА (Materialprüfanstalt für das Bauwesen, Braunschweig, Germany) for use class 1 and 2 according to EN335-1. Tested according to European Standard: ЕN46, EN73, EN 113/84, EN113. Impralit® IT is offered as a concentrate. Preparation of working solution: water in relation 1:9. 1, 3, 5, 10, 20, 1000 ltr. Application recommendations: 20 ml. concentrate per m² or 2 ltr per 1 m³.